CMC launched its Constituent Relationship Management (CRM) platform in the spring of 2017. Over the last year, our team has been steadily building our directory of information on co-operatives and mutuals, including information such as their location and what they do. Phase one of this project was to validate a contact list of all co-operatives and mutuals in Canada with the help of a team of student researchers and project lead, Mark Ventry. As you can imagine, this has been a big challenge. Now that we have a broad profile of the Canadian co-operative and mutual landscape, we are preparing for Phase two of our research. We have already tested the custom survey tool that allows co-operatives to securely update their own records on the National database. What we learned in that process will now be applied to a more refined approach to surveying different sectors. CMC now has a powerful surveying, tracking, and communications tool built on the established open source platform, CiviCRM. Over the course of 2018, CMC will continue to add data to organization profiles by focusing on specific sectors in partnership with our member federations and other partners. The long-term vision for the CRM is to establish a best-of-class platform for researchers, educators, and policy advocates that is operated and governed in a co-operative way while respecting the time and privacy of Canada's co-operative and mutual community. CMC is asking for your support to make this a reality. The major challenge to timely and accurate data that can improve decisions is an over surveyed co-operative community. Our challenge is to make data collection as straightforward and accessible as possible for the end user, to whom we are incredibly grateful and highly conscious of the value of their time. When the CMC survey lands in your inbox, we hope you can take a moment to respond and understand how valuable your participation is to developing the co-operative sector in Canada, and how we are always waiting to hear from you on ways to make it easier for you. 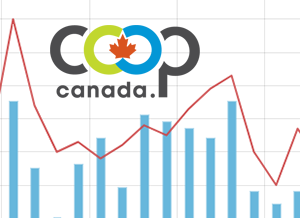 The Co-operatives and Mutuals Canada Annual Report 2017 - 2018 can be downloaded in PDF. What is a Co-op? What is a Mutual?